Draft: 2015, Cincinnati Reds, 3rd rd. The Louisiana native's last name is pronounced TRUH-haw...in 2018 received the prestigious Rawlings Gold Glove Award for minor league shortstops...in each of the last 2 seasons led his league's shortstops in highest fielding percentage (2017 Southern League, .982; 2018 International League, .984)...in 2016 led the Florida State League in apps and runs scored...from 4/22-5/25 reached base safely in 31 straight games, the FSL's longest on-base streak of that season...was Florida State League Player of the Week from 8/22-8/28...in 2015 was a Pioneer League All-Star...in January 2019 participated in Major League Baseball's Rookie Career Development Program...in 2019 participated in his first official Major League spring training camp...while in minor league camp over the previous 3 Cactus League seasons made 26 apps for the Reds (hit .429 in 13g in 2016, hit .333 in 8g in 2017, went 0-for-6 in 5g in 2018). Graduated from Kinder (LA) High School...played at the University of Louisiana at Lafayette, where in 2015 he was named Sun Belt Conference Player of the Year...in 2014 became the first Cajuns player to play with the USA Baseball Collegiate National Team...also that year was named the Sun Belt Conference Tournament's Most Outstanding Player and a Baseball America second-team All-American...follow on Twitter @Baby_Trahan. Was the shortstop on the Minor League Rawlings Gold Glove Award team...only 9 minor league players are recognized each season for defensive excellence...C Tucker Barnhart was named to the team in 2011 and SS Zach Vincej in 2016...spent the minor league season at Louisville, where he led the Bats in games, at bats and walks...made 127 starts at SS and 2 starts at 2B...among the International League leaders ranked sixth in apps and T1st in sac bunts (12)...led IL shortstops in fielding percentage (.984)...in his Major League debut, as a September callup made 11 apps and 2 starts for the Reds...made 5 apps and both of his starts at shortstop (9/3 at Pit, 9/21 at Mia)...also played 2B (3g) and 3B (2g)...was 1 of 9 Reds to make his Major League debut (IF Alex Blandino, RHP Tanner Rainey, RHP Zack Weiss, IF/OF Rosell Herrera, IF/OF Brandon Dixon, RHP Jesús Reyes, OF Aristides Aquino, OF Gabriel Guerrero)...joined the Reds when rosters expanded on 9/1...in the 5-1 loss on 9/3 at Pit started at SS in his Major League debut...in the seventh inning singled off Trevor Williams for his first career hit...in the fifth inning on 9/30 vs Pit, in the Reds' final game of the season, singled off Tanner Anderson to produce his first career RBI...an inning later, the scoring decision on that hit was changed to an error on 2B Kevin Kramer, taking away the RBI...produced 3 of Louisville's 6 walkoff wins, including 2 run-scoring singles and a squeeze bunt. 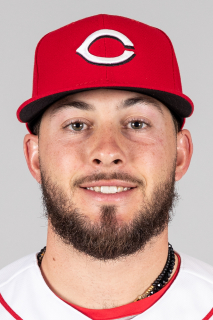 March 22, 2019 Cincinnati Reds optioned SS Blake Trahan to Louisville Bats. September 1, 2018 Cincinnati Reds selected the contract of SS Blake Trahan from Louisville Bats. April 4, 2018 SS Blake Trahan assigned to Louisville Bats from Pensacola Blue Wahoos. February 24, 2018 SS Blake Trahan assigned to Cincinnati Reds. April 6, 2017 SS Blake Trahan assigned to Pensacola Blue Wahoos from Louisville Bats. March 29, 2017 SS Blake Trahan assigned to Louisville Bats from Daytona Tortugas. February 24, 2017 SS Blake Trahan assigned to Cincinnati Reds. March 1, 2016 SS Blake Trahan assigned to Cincinnati Reds. August 20, 2015 SS Blake Trahan assigned to Daytona Tortugas from Billings Mustangs. June 17, 2015 SS Blake Trahan assigned to Billings Mustangs. June 16, 2015 Cincinnati Reds signed SS Blake Trahan.